Fair point but I think it also contributes to why I thought it was his most impressive performance. After forcing a safety on the Broncos first play from scrimmage, the Vikings got the ball back and put together a nice drive down to the Denver eight yard line before safety Brian Dawkins poked the ball from Christian Ponder‘s grasp. Though the Vikings forced a three-and-out, the fumble cost the Vikings at least three points. On the Vikings ensuing possession, however, Ponder didn’t recognize that Broncos linebacker Mario Haggan had dropped into coverage and through the ball right to him for a pick-six. It may seem like a boneheaded play, and it is, but you’d be surprised at how easy it is for a defender to be rendered essentially invisible when you’re intensely focusing on something else. (Check out this psychology experiment to see what I mean). That doesn’t excuse the pick, of course, but it is a mistake that is all too common for rookie quarterbacks. So Ponder is responsible for two turnovers in the first half of the game, one of which handed seven points to the Broncos and the other may have taken at least three points off the board. Yet he didn’t let those mistakes affect his play. He came back and matched the Broncos blow for blow, especially during a second half in which is defense’s backfield couldn’t stop a snail. Ponder threw the ball 47 times on Sunday, 29 of which were completions for a 61.7% completion percentage, for 381 yards, three touchdowns and those two interceptions. If you hadn’t actually seen the two interceptions, those stats would be mighty impressive even for a loss. Ponder ran the ball only once, but that was a 12 yard gain to convert a third down. He took three sacks. Ponder did all this while getting pummeled early and often and even when the offensive line pulled it together to keep him from getting ripped from limb to limb, they only offered him a modicum of protection, so he still didn’t have All Kinds Of Time, as the song goes. 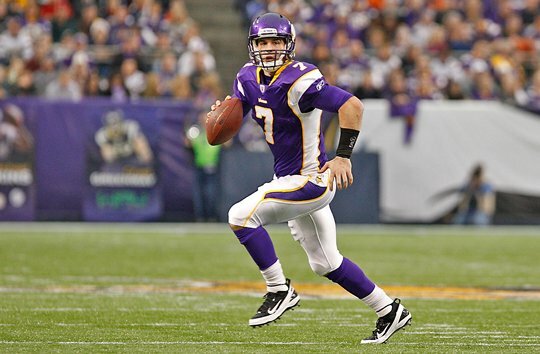 The 32 points the Vikings scored Sunday were the most they’ve accumulated under his leadership. Ponder sealed his team’s fate with another interception that resulted from another rookie mistake. He was trying to bait the corner into covering the front receiver so he could throw over him to the deeper receiver. But there wasn’t enough cushion between the two receivers and Goodman easily sank back between the two and picked off the ball. If the Vikings defense in the second half played anywhere near the level of play they displayed in the first half, the Vikings would’ve won despite Ponder’s mistakes. What we’ve got left in this season is evaluating what we’ve got to work with (and what we don’t have to work with) for next season. If you want a silver lining it’s that we’ve found a young quarterback for whom the game is not too big, who appears to have the emotional, mental and physical characteristics to be great. This game against Denver demonstrated that he can do a lot with little. He lead the Vikings to 32 points with an inconsistent offensive line that affords him precious little time to make decisions, no Adrian Peterson, and Percy Harvin as the only elite receiver on the field. You put some more talent around him coupled with the invaluable experience he’s gaining this year, and he’s gonna be fun to watch next year. Hell, he’s fun to watch this year.